Back of card: A beautiful Navajo-rug type pattern, difficult to describe. Essentially an orange square with a green diamond in the center with a pink cross inside that, all with bold black outlining. Booklet included: Yes, small, 32 pages, 2.6 x 4.45 inches, or 65 x 114 mm. Text by Tracy LeCocq. Comments: As you might gather if you've read our comments on other decks, we're familiar with a variety of different religious/political/social/mythical modalities & it's hard to stump us. But the art of the native peoples of the American southwest are the exception. Their art is a complete mystery. So look again at these cards. Native art of the American Southwest (these cards Navajo inspired) ranges from abstractions with a slim basis in archetype, to the completely inexplicable. Yet when we look at the art we find a strong coherence in it. The artists are showing us something, something that is both real & presumably normal to them. But what? And please don't tell me "UFO's". That stuff isn't even in the ballpark by comparison. Hopi art is even more puzzling than Navajo, would love to find a Hopi tarot. 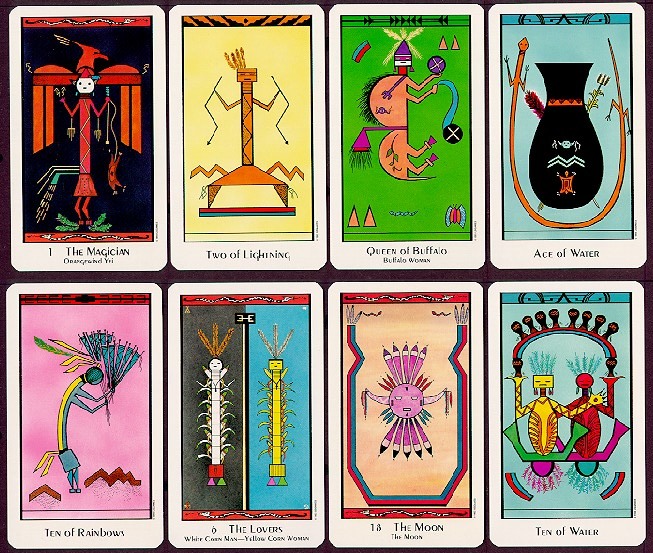 A few of the cards are recognizable from the Rider Waite deck, two of them are shown above: The ten of Rainbows (ten of wands) and the Ten of Water (ten of cups). Suits: Rainbows (wands); Water (cups); Lightning (swords); and Buffaloes (pentacles). So the first row of cards, above, shows the same four cards as are shown on all the other decks. Court cards are labeled the usual King, Queen, Knight, Page, though, of course, with the usual abstractions. For metaphysical students, this deck will either repay close study, or drive us all nuts. There are few hints in the tiny booklet. A beautiful deck.